On thursday morning I started calling different motorcycle rental places to find a bike. Most of the rentals were out of bikes but finally I was able to find a reasonably priced BMW F650GS from Sama Tours in Hatfield, Pretoria (Darryl Berman, Tel +27825516132, Web www.samatours.co.za). Unfortunately the bike's battery needed to be changed so I could start my trip only after 3pm. After consulting with Rudi I decided to head for Blyde River Canyon, the 3rd largest in the world after Grand Canyon in USA and Fish River Canyon in Namibia. The evenings riding took me to the Robbers' Pass, a twisty pass leading to the restored mining village of Pilgrims Rest. The road was dark and covered in thick mist, and suddenly there was a herd of cows right in front of me! Luckily the tyres took grip and I managed to evade them. The cows were left mooing surprisedly as I twisted my throttle, speeding into the village. I found the Royal Hotel (Tel +27-13-768-1100, Web www.royal-hotel.co.za), founded in 1873, from the village Uptown and booked a nice Victorian styled room. After an adequate dinner in the hotel restaurant and some beers in the Church bar I set in for the night. In the morning I found a nice gravel road following the Blyde river from Pilgrims Rest to Bourke's Luck Potholes. Soon my clothes were covered in splashes of thick red mud as I blasted along the empty road. Sight of two baboons running across the road in front of me and disappearing to the bush raised a thick smile to my face. Finally, I was in Africa! In Bourke's Luck the gas situation was starting to look alarming, and as the township didn't have a petrol station I decided to turn south, following a tar road to the nearest bigger town. 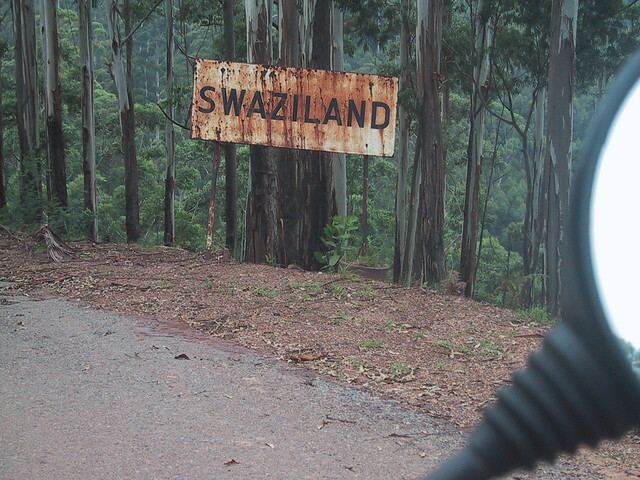 After filling up I consulted the map and headed for the kingdom of Swaziland, a small monarchy situated in the border of South Africa and Mozambique. After some nice riding on twisty main roads, sometimes spotting signs like hippo warnings I stopped in Barberton for a fill up. From there I took the Saddleback Pass, a challenging 43 kilometer gravel route winding its way across the Drakensberg mountains. There was no other traffic on the road, and I spent most of the time riding inside a cloud, struggling to keep the bike on correct course on the more challenging parts of the route. In Bulembu I had my first African border crossing with a motorcycle, which proved to be a very easy experience. I was asked for a 5 rand road tax in Swaziland, but otherwise had none of the problems we had had crossing the border to Lesotho. The roads turned a lot better in Pigg's Peak, and I continued riding among the hilly scenery to Mbabane, the capital of the kingdom. As Mbabane didn't look very interesting, I rode on to the nearby Ezulweni valley (Valley of Heavens), famous for its holiday opportunities. On the entrance to the valley there was a huge crafts market area where I was able to find a a traditional smoking pipe made out of ebony. I quickly spotted a sauna facility (Swazi Spa) on the side of the road and made the decision on staying in Swaziland for the night instead of pressing on for the Indian Ocean. After checking in to a nearby Backbackers Hostel I went to check out the sauna. Swazi Spa is a collection of whitewashed beehive huts located near some natural hot springs. The spa package cost 50 rand for unlimited time, with the ability to order beverages as needed. The actual sauna was made in Finnish style, except for the fact that visitors were not allowed to throw water on the rocks, leaving this task for the sauna attendants. The sauna was filled with Swazis, making me the only foreign visitor. During the several rounds of sauna and cooling off outside, I had several interesting conversations, ranging from "Our king has 11 wives and so doesn't have time to govern his country" to "If Adam and Eve were Chinese, we would still be living in Paradise". Apparently the Swazi culture is a mixture of local traditions and the Christian religion. Not surprisingly I was the last visitor in the sauna, and spent a while chatting with Tulil, the Swazi girl managing the Spa. Following her suggestion I went for an excellent curry dinner in the First Horse restaurant. After dinner I took a short visit to the Why Not disco, but not liking the atmosphere returned to the hostel where I shared some beers and chat with the guy running the place. The most concrete outcome of the evening was learning the Swazi word for beer, "Chuala". After a mosquito-ridden night I went to see the nearby reconstructed 19th century rural Swazi village. As I had worked in similar historical re-enactment projects earlier I was interested in how things like that were handled in Africa. The employees didn't seem too enthusiastic about their job, and so the whole experience was quite cheesy. However, with the same ticket I was able to enter the national park surrounding the village. There were numerous baboons and a kudu antelope hiding in bushes. The very beautiful twin waterfall was easy to find following the signs posted on the road. As there was nobody in sight, and so signs strictly prohibiting it I waded across the river and went for a refreshing swim in the pool beneath the falls. After the national park I continued my way back to South Africa. When stopping for an ATM in the Royal Swazi golf resort I passed the royal motorcade, completing my short visit to the kingdom.